, a very learned writer and statesman, in the reigns of Edward VI. and Elizabeth, was born ^larch 28, 1514, at Saffron-Walden in Essex. He was the son of John Smith, a gentleman of that place, who was much inclined to the principles of the reformation, which had then made but a very small progress. After attending a grammar-school, Thomas was sent about 1528 to Queen’s college, Cambridge, where he greatly distinguished himself, and had a king’s scholarship at the same time with the celebrated John Cheke. Queen’s college was one of those which favoured the opinions of Erasmus and Luther, and many of the members used to confer privately together about religion, in which they learned to detect the abuses of the schools, and the superstitions of popery. 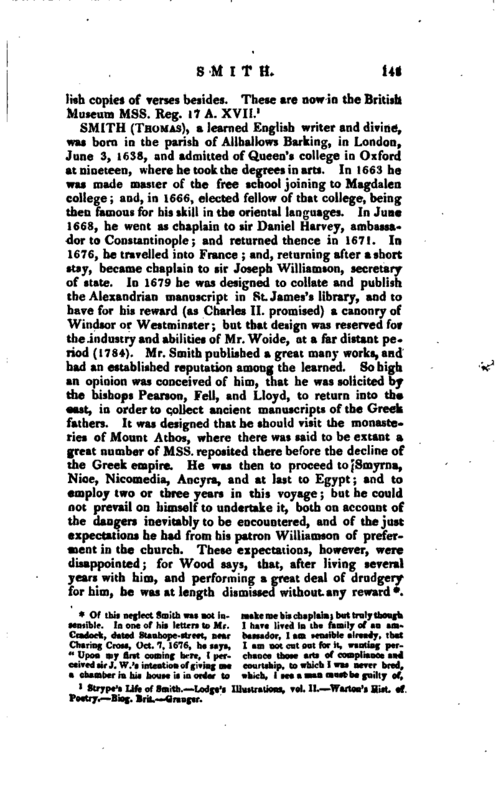 In such conferences Mr. Smith probably took his share, when of sufficient standing to be admitted, which was very soon, for in 1531 he was chosen a fellow of the college. In the mean time he had formed a strict friendship with Cheke, and they pursued their classical studies together, reading Cicero, Plato, Demosthenes, and Aristotle: and such was Smith’s proficiency, that about 1533 he was appointed Greek professor in the university. 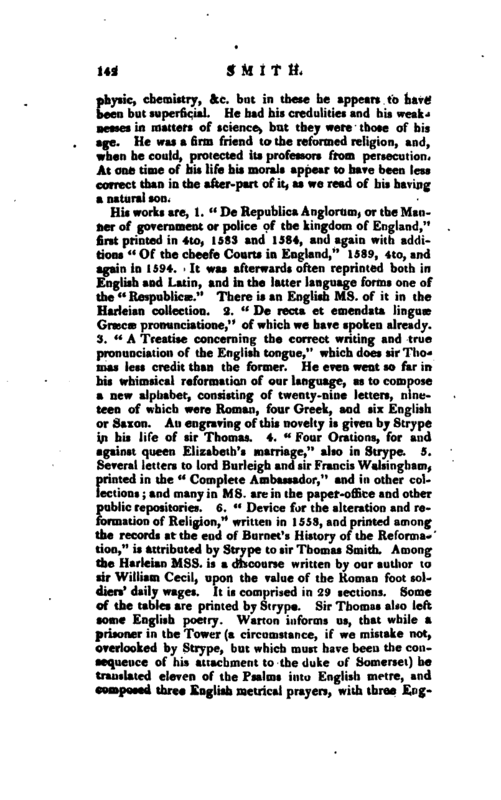 About this time he and Cheke introduced a new mode of reading Greek, being dissatisfied with the corrupt and vicious pronunciation which then prevailed. As this was accounted an innovation of the most important, and even dangerous tendency, and exhibits a curious instance of the manners and sentiments of the times, we shall give a more particular account of it in the plain language of honest Strype. According to this biographer, it appears that “custom had established a very faulty manner of sounding several of the vowels and diphthongs; for, i, n 9 v, ei, 01, w, were all pronounced as lura;” nihil fere aliud,“says Smith,” haberet ad loquendum, nisi lugubrss sonos et illud flebile /wra.“He conferred therefore with Cheke upon this point, and they perceived that the vulgar method of pronouncing Greek was false; since it was absurd, that so many different letters and diphthongs should all have but one sound. They proceeded to search authors for the determination of this point: but the modern writers little availed them; they had not seen Erasmus’s book, in which he excepted against the common way of reading Greek. But though both of them saw these palpable errors, they could not agree among themselves, especially concerning the letters | vna and i/4-jXov. Soon after, having procured Erasmus’s book, andTerentianus” de literis et syllabis,“they began to reform their pronunciation of Greek privately, and only communicated it to their most intimate friends. When they had sufficiently habituated themselves to this new method of pronunciation, with which they were highly pleased, on account of the fullness and sweetness of it, they resolved to make trial of it publicly; and it was agreed that Smith should begin. He read lectures at that time upon Aristotle” de Republic^,“in Greek, as he had done some years before: and, that the novelty of his pronunciation might give the less offence, he used this artifice, that in reading he would let fall a word only now and then, uttered in the new correct sound. At first no notice was taken of this; but, when he did it oftener, his auditors began to observe and listen more attentively; and, when he had often pronounced n and 01, as e and w, they, who three years before had heard him sound them after the old way, could not think it a slip of the tongue, but suspected something else, and laughed at the unusual souncks. He again, as though his tongue had slipped, would sometimes correct himself, and repeat the word after the old manner. But, when he did this daily, some of his friends came to him, and told him what they had remarked in his lectures: upon which he owned that he had been thinking of something privately, but that it was not yet sufficiently digested and prepared for the public. They, on the other hand, prayed him not to conceal it from them, but to acquaint them with it frankly; and accordingly he promised them that he would. Upon this rumour many resorted to him, whom he desired only to hear his reasons, and to have patience with him three or four days at most; until the sounds by use were made more familiar to their ears, and the prejudice against their novelty worn off. 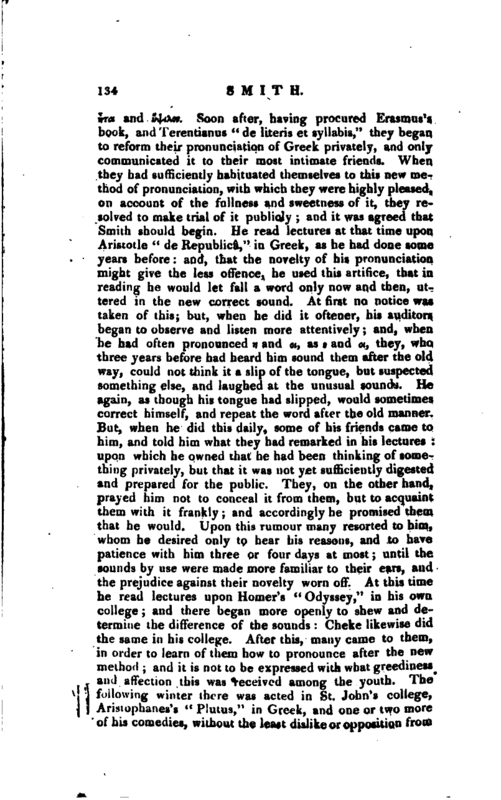 At this time he read lectures upon Homer’s” Odyssey,“in his own college; and there began more openly to shew and determine the difference of the sounds: Cheke likewise did the same in his college. After this, many came to them, in order to learn of them how to pronounce after the new method; and it is not to be expressed with what greediness and affection this was received among the youth. The following winter there was acted in St. John’s college, Aristophanes’ s” Plutus," in Greek, and one or two more of his comedies, without the least dislike or opposition from | any who were esteemed learned men and masters of the Greek language. 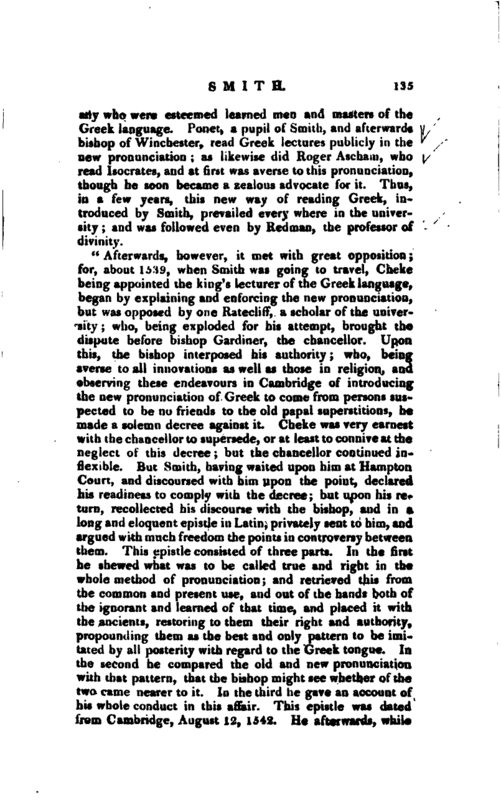 Ponet, a pupil of Smith, and afterwards bishop of Winchester, read Greek lectures publicly in the new pronunciation; as likewise did Roger Ascham, who read Isocrates, and at first was averse to this pronunciation, though he soon became a zealous advocate for it. 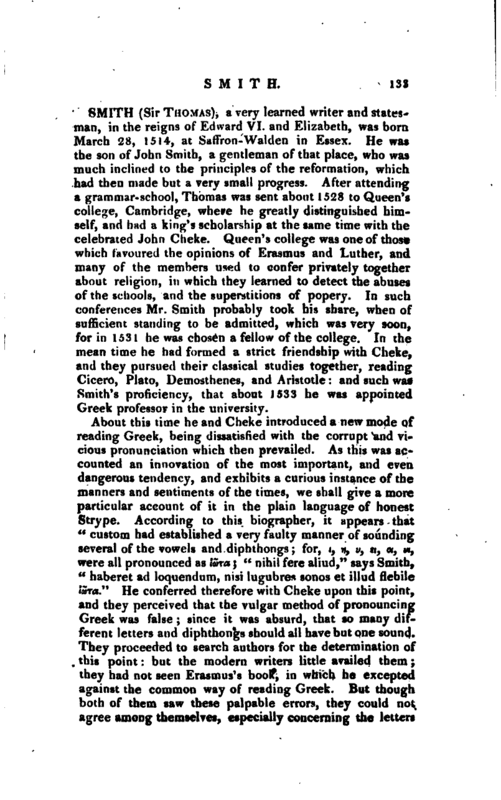 Thus, in a few years, this new way of reading Greek, introduced by Smith, prevailed every where in the university; and was followed even by Redman, the professor of divinity. 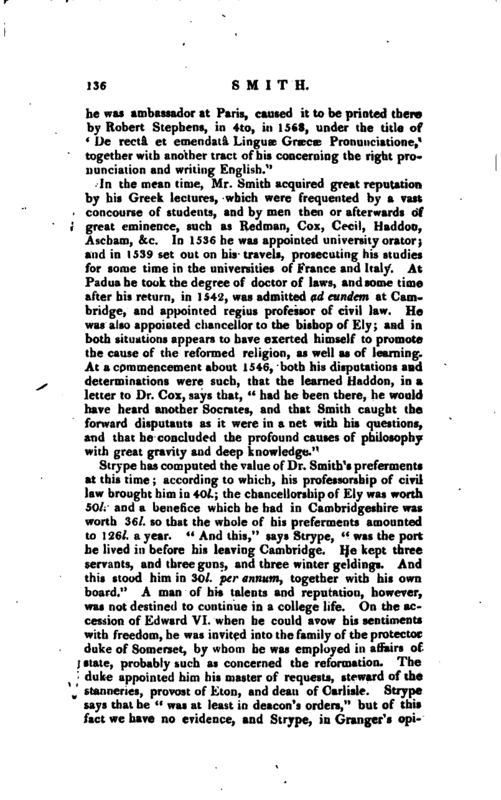 Strype lias computed the value of Dr. Smith’s preferments at this time; according to which, his professorship of civil law brought him in 40l. ; the chancellorship of Ely was worth 50l. and a benefice which he had in Cambridgeshire was worth 36l. so that the whole of his preferments amounted to 126l. a year. “And this,” says Strype, “was the port he lived in before his leaving Cambridge. He kept three servants, and three gun-;, and three winter geldings. And this stood him in 3o/. per annum, together with his own board.” A man of his talents and reputation, however, was not destined to continue in a college life. On the accession of Edward \ I. when he could avow his sentiments with freedom, he was invited into the family of the protector duke of Somerset, by whom he was employed in atiairs of state, probably such as concerned the reformation. The duke appointed him his master of requests, steward of the stannenes, provost oi Eton, and dean of Carlisl Strype says that he “was at least in deacon’s orders,” but of this fact we have no evidence, and Strype, in Granger’s | opinion, seems to have hazarded the conjecture because he could not otherwise account for the spiritual preferments he enjoyed. We have just mentioned that he had a benefice in Cambridgeshire, which was the rectory of Leverington, and this was conferred on him in the time of Henry VIII. ; but a rectory might have been held by any one who was a clerk at large; for though the law of the church was, that in such a case, he should take the order of priesthood within one year after his institution, yet that was frequently dispensed with. In 1551, sir Thomas was appointed one of the ambassadors to the court of France, to treat concerning a match for the king with the eldest daughter of the king of France; but the king’s life was now at a close, and on the accession of Mary, sir Thomas was deprived of all his places, and was charged not to depart the kingdom; yet enjoyed uncommon privileges. He was allowed a pension of 100l. per annum; he was highly favoured by Gardiner and Bonner on account of the opinion they had of his learning; and enjoyed a particular indulgence from the pope, which was occasioned by the following circumstance. In 1.555, William Smythwick of the diocese of Bath, esq. obtained an indulgence from Pius IV. by which he and any five of his friends, whom he should nominate, were to enjoy extraordinary dispensations. 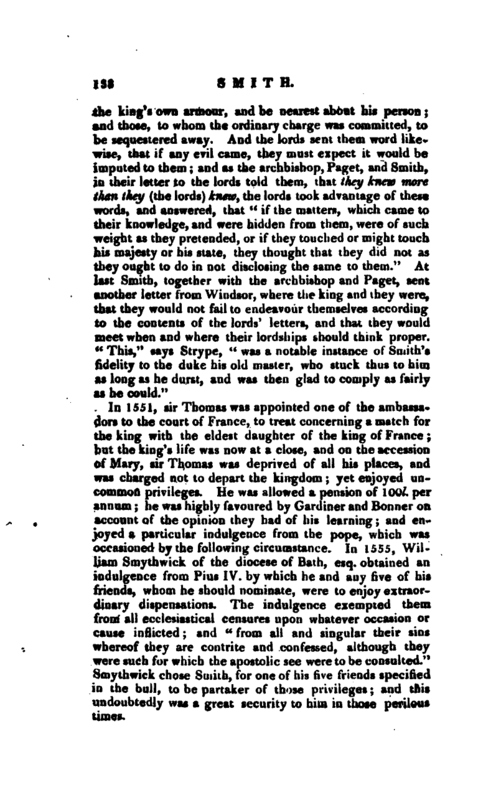 The indulgence exempted them from all ecclesiastical censures upon whatever occasion or cause inflicted; and “from all and singular their sins whereof they are contrite and confessed, although they were such for which the apostolic see were to be consulted.” Smythwick chose Smith, for one of his five friends specified in the bull, to be partaker of those privileges; and this undoubtedly was a great security to him in those perilous times. 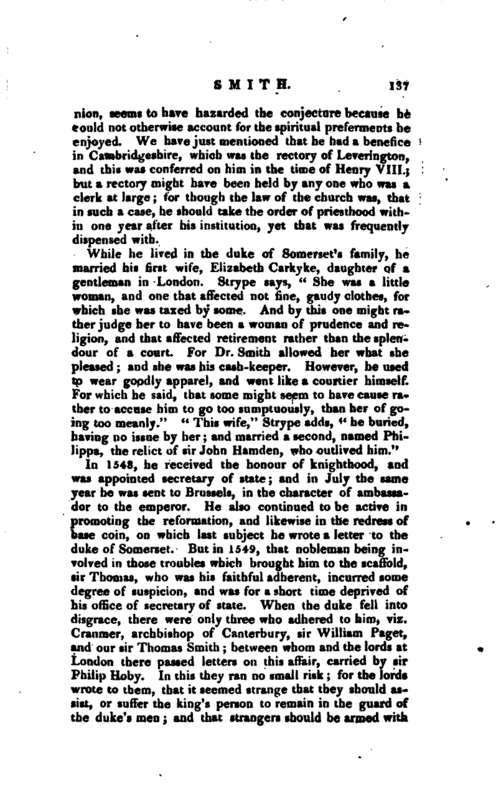 | On the accession of queen Elizabeth, sir Thomas Smith was again received at court, and employed in affairs both of church and state. He was also sent on various embassies. In 1562 he was sent ambassador to France, where, in conjunction with sir Nicholas Throgmorton, he concluded a peace between England and France in the beginning of 156*, but was still continued ambassador in France. In March 1565 he finished his treatise of “the Commonwealth of England,” and in the beginning of the year following returned to England. In 1567 he was again sent ambassador to France to demand the restitution of Calais; and upon his return from thence in 1568, he solicited for the place of chancellor of the duchy of Lancaster, but without success, it being given to sir Ralph Sadleir. In 1570 he was admitted into the privy council, and in 1572, he was again appointed secretary of state, and chancellor of the order of the garter. Sir Thomas, with all his talents and good sense, was much of a projector, and about this time engaged in a foolish scheme for transmuting iron into copper. Into this project, says Strype, “he brought sir William Cecil, secretary of state, who had a philosophical genius, the earl of Leicester, sir Humphrey Gilbert, and others. 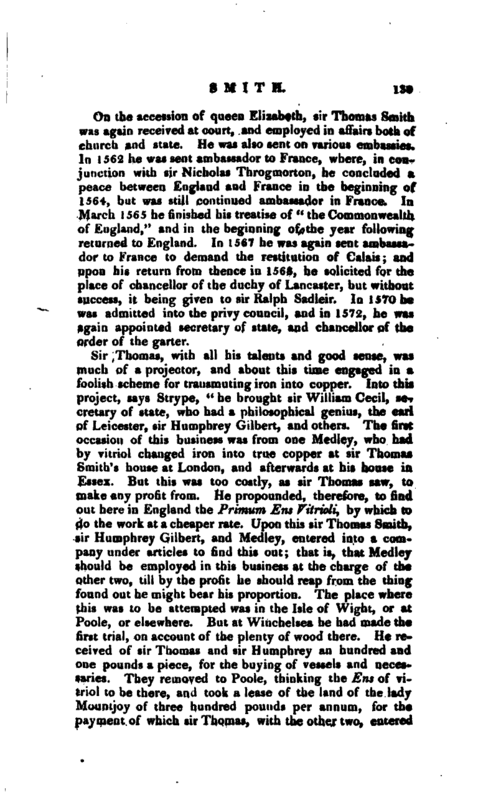 The first occasion of this business was from one Medley, who had by vitriol changed iron into true copper at sir Thomas Smith’s house at London, and afterwards at his house in Essex. But this was too costly, as sir Thomas saw, to make any profit from. He propounded, therefore, to find out here in England the Primum Ens Vitrivli, by which to do the work at a cheaper rate. 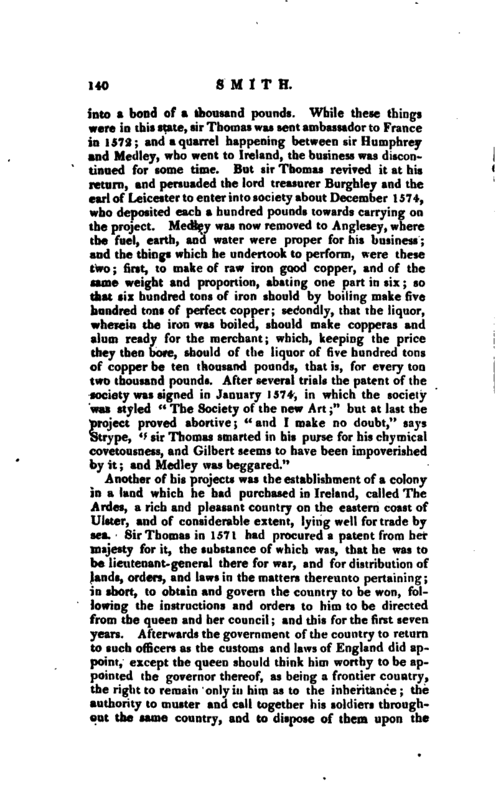 Upon this sir Thomas Smith, sir Humphrey Gilbert, and Medley, entered into a company under articles to find this out; that is, that Medley should be employed in this business at the charge of the other two, till by the profit he should reap from the thing found out he might bear his proportion. The place where this was to be attempted was in the Isle of Wight, or at Poole, or elsewhere. But at Winchelsea he had made the first trial, on account of the plenty of wood there. He received of sir Thomas and sir Humphrey an hundred and one pounds a piece, for the buying of vessels and necessaries. They removed to Poole, thinking the Ens of vitriol to be there, and took a lease of the land of the lady Mountjoy of three hundred pounds per annum, for the payment of which sir Thomas, with the other two, entered | into a bond of a thousand pounds. While these things were in this state, sir Thomas was sent ambassador to France in 1572; and a quarrel happening between sir Humphrey and Medley, who went to Ireland, the business was discontinued for some time. But sir Thomas revived it at his return, and persuaded the lord treasurer Burghley and the earl of Leicester to enter into society about December 1574, who deposited each a hundred pounds towards carrying on the project. Medley was now removed to Anglesey, where the fuel, earth, and water were proper for his business; and the things which he undertook to perform, were these two; first, to make of raw iron good copper, and c,f the same weight and proportion, abating one part in six; so that six hundred tons of iron should by boiling make five hundred tons of perfect copper; secondly, that the liquor, wherein the iron was boiled, should make copperas and alum ready for the merchant; which, keeping the price they then bore, should of the liquor of five hundred tons of copper be ten thousand pounds, that is, for every ton two thousand pounds. After several trials the patent of the society was signed in January 1574, in which the society was styled” The Society of the new Art;“but at last the project proved abortive;” and I make no doubt,“says Strype,” sir Thomas smarted in his purse for his chymical covetousness, and Gilbert seems to have been impoverished by it; and Medley was beggared." Another of his projects was the establishment of a colony in a land which he had purchased in Ireland, called The Ardes, a rich and pleasant country on the eastern coast of Ulster, and of considerable extent, lying well for trade by sea. Sir Thomas in 1571 had procured a patent from her majesty for it, the substance of which was, that he was to be lieutenant-general there for war, and for distribution of Jands, orders, and laws in the matters thereunto pertaining; in short, to obtain and govern the country to be won, following the instructions and orders to him to be directed from the queen and her council; and this for the first seven years. Afterwards the government of the country to return to such officers as the customs and laws of England did appoint, except the queen should think him worthy to be appointed the governor thereof, as being a frontier country, the right to remain only in him as to the inheritance; the authority to muster and call together his sol tiers throughout the same country, and to dispose of them upon the | frontiers, as he should see cause for the better defence of the country. Sir Thomas sent his natural son, Thomas Smith, with a colony thither, who did good service there, but was at last intercepted and slain by a wild Irishman. The settlement of this colony cost sir Thomas ten thousand pounds; but after his death it seems to have been neglected for some time, and the Ardes were afterwards lost to his family, being given away by king James I. to some of the Scots nobility. 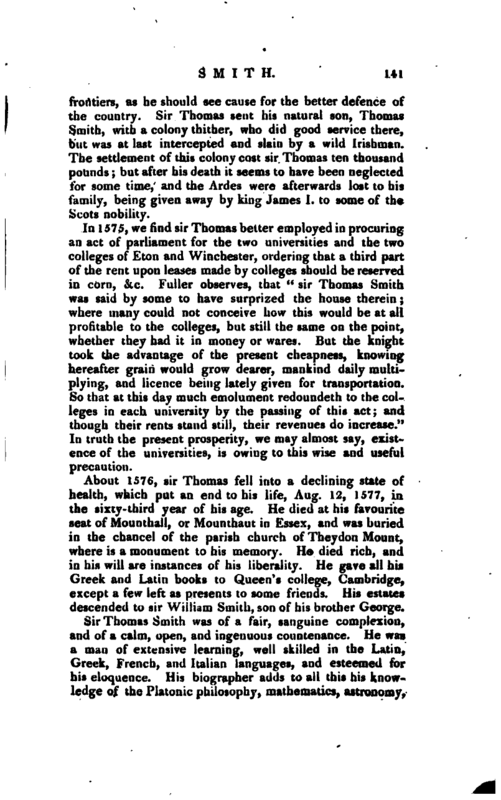 In 1575, we find sir Thomas better employed in procuring an act of parliament for the two universities and the two colleges of Eton and Winchester, ordering that a third part of the rent upon leases made by colleges should be reserved in corn, &c. Fuller observes, that “sir Thomas Smith was said by some to have surprized the house therein; where many could not conceive how this would be at all profitable to the colleges, but still the same on the point, whether they had it in money or wares. But the knight took the advantage of the present cheapness, knowing hereafter grain would grow dearer, mankind daily multiplying, and licence being lately given for transportation. So that at this day much emolument redoundeth to the colleges in each university by the passing of this act; and though their rents stand still, their revenues do increase.” In truth the present prosperity, we may almost say, existence of the universities, is owing to this wise and useful precaution. About 1576, sir Thomas fell into a declining state of health, which put an end to his life, Aug. 12, 1577, in the sixty-third year of his age. He died at his favourite seat of Mounthall, or Mounthaut in Essex, and was buried in the chancel of the parish church of Theydon Mount, where is a monument to his memory. He died rich, and in his will are instances of his liberality. He gave all his Greek and Latin books to Queen’s college, Cambridge, except a few left as presents to some friends. His estates descended to sir William Smith, son of his brother George. Sir Thomas Smith was of a fair, sanguine complexion, and of a calm, open, and ingenuous countenance. He was a man of extensive learning, well skilled in the Latin, Greek, French, and Italian languages, and esteemed for his eloquence. His biographer adds to all this his knowledge of the Platonic philosophy, mathematics, astronomy, | physic, chemistry, &c. but in these he appears to have been but superficial. He had his credulities and his weaknesses in matters of science, but they were those of his age. He was a firm friend to the reformed religion, and, when he could, protected its professors from persecution At one time of his life his morals appear to have been less correct than in the after-part of it, as we read of his having a natural son. Strype’s Life of Smith. Lodge’s Illustrations, Yol. II. Wartou’s Hist, of Poetry. Biog, Brit. Granger.